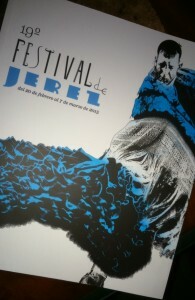 For a fortnight, ending last Saturday, the city of Jerez resounded, even more than is usual, to a flamenco rhythm. Four official venues, numerous penas, or clubs, and many tabancos, or small bars, staged performances from the intimate to the grand. Your blogger attended not a few, passing from the large stage of the Teatro Villamarta to the tiny El Pasaje tabanco bar. More often than not there was standing room only as locals, as well as visitors from around the globe, drank in the artistry, intensity and emotion that is flamenco. 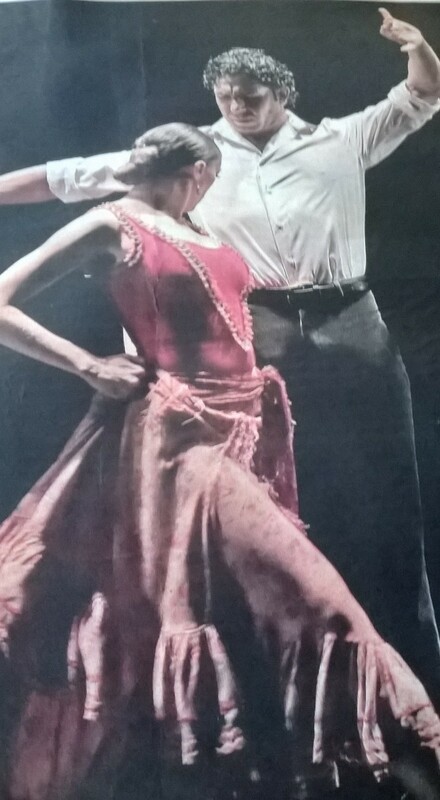 My flamenco week started at the Teatro with the Compania Antonio Gades in ‘Fuego‘ a ballet by Gades and Carlos Saura, inspired by ‘El amor brujo’ Manuel de Falla’s ballet. Gades was a well respected, much loved figure in the flamenco world, who experimented with a fusion of flamenco and ballet, on stage and in the cinema. Nonetheless, this performance, though with moments of exquisite artistry and some truly outstanding and memorable stage pictures, did not engage me wholeheartedly. The story of Candela, who falls in love with Carmelo, only to be pursued by the spectre of Jose, her dead lover, is the same as the original ballet and provides great opportunity for drama. Unfortunately, at the third appearance of El Espectro, to again divide the young lovers, this particular member of the audience began to think ‘Get a grip, Candela…’ while the young Spanish girl sitting next to me was, again, in floods of tears. This is not to detract from the quality of the dancing, especially of Esmeralda Manzanes as Candela and Jacon Guerrero as Carmelo ( pictured right ) and the excellent corps de ballet. I also found the mix of live flamenco on stage and recorded orchestral score was disconcerting. All in all, a bit of a curate’s egg to begin the week. But could this be the fault of your blogger’s stolid Anglo lack of emotional sympathy? No, I am as capable as anyone of being transported and this definitely happened on Monday evening at the Palacio Villavicencio when the first a cappella notes of the husky-voiced Eva Rubichi raised the hairs on the back of my neck. Not only I. The whole audience felt a tingle down its collective spine as all were transfixed. Rubichi’s sultry and powerful rendition of traditional flamenco songs and themes, such as the inevitability of death, love and loss, resonated with a force which seemed age-old. The call of the muezzin from the minaret, the ululations of the wedding guests, the wailing of the bereaved could all be heard in her songs and she and her guitarist accompanist and husband, Domingo, were cheered to the rafters in a standing ovation which would not allow them and their small band to leave without encores. Amazingly, this astonishing singer appears regularly at the Pena Flamenca, ( flamenco club ) La Buleria in Jerez throughout the year. See a clip of one of her formal concerts below. I will continue to report on my flamenco week later, but, before I go, yes, that is a man in a dress on the cover of the Festival Programme. In recent years female flamenco dancers have often adopted male garb in their performances as well as their traditional flounced dresses . This year the tables were turned and at least one man wore a skirt. I saw him and he, and his fellow artists, were remarkable. I will report on him and others in my next blog. In the meanwhile you can find out more about the festival, including videos of many of the performances, at the festival web-site.